I'm writing a fantasy story set in an imaginary world. For the first time, I'm giving geographical information and... I don't really know how to give it, actually. My alpha reader told me it was hard to use my current information to visualize anything because it was too scarce and imprecise. I could give measurements in kilometers for instance, but I feel like it ruins the magic of the fantasy setting, as well as being too precise compared to the characters' knowledge (my narration is very close to their points of view and the characters are mostly illiterate, being brought up in a military orphanage). Of course, I considered giving time estimations, but I'm not really satisfied with it either, because of both the previous argument and the fact that my characters will have to walk to Country B from Capital City, but not in a straight line and with stops in various cities, so it will be longer than it could. How can I give enough information to let my readers have a sufficient mental representation of my world's cartography, without breaking the immersion too much? In Uprooted, Naomi Novik deals quite elegantly with this issue. First, she doesn't dump all the information at once, but sprinkles it where it's relevant. So we learn the topographic details (valley, mountains on one side, forest on the other, you can see from one end to the other from atop a hill. So gradually we learn the name of the country (Polnya), and that there's another country (Rosya), that the court of Polnya is some distance from the valley, that there's a place called "Yellow Marshes" and it's close enough for villagers to be familiar with how their lord acts. All of this information is interwoven with the narration. Because the cartography information is interwoven with the narration, it creates a general picture that fits into the story, instead of requiring the reader to remember details that are not connected to anything. Distances in kilometres are less important than "how long it would take to travel from point A to point B". If there's a mountain range between point A and point B, they're for all intents and purposes farther apart than if there were fields there instead. It used to be quite common to measure distances in days of travel (on horse, on foot), and that's information you can expect a common illiterate person to know; not from one side of the country to another, but from one village to another, to the nearest city, etc. A person would know quite well the area within which he routinely travels (whether it's a farmer who travels as far as the nearest market, or a peddler who does somewhat longer journeys, or a soldier who's being sent every which way). Beyond that, they'd have an idea of what's around, gleaned from what they head at the market or in a tavern. And further away it's names of important locations and "here be dragons". If you think about it, there was no reason for an average person to care about distance in km, but every reason to care about distance in travel-days. tl;dr topographic features ("I can see the mountains from my village") and travel times give a general frame of things without breaking the immersion. It doesn't need to be terribly detailed, and it is a beloved convention of fantasy genre. You can give hints of cartography through the words you choose. As for an example, let's call country A the Holy Empire of Highmarch, and country B the Duchy of Hillsberry. I just made up these names. But what do they tell to the reader? For country A, we now know that it is probably a vast territory, that religion has a great part in it, and that Highmarch must refers to mountains or harsh lands, and only with these informations you already can figure what the people would look like, how hard is their lifes, and so on. For country B, the fact this is a Duchy means a smaller territory, with less authority, and the Hillsberry part probably reminds you of, let's say, hills and berries, two things that are probably nicer than anything in Highmarch. Also, keep in mind that Kingdoms are good, Empires are evil: the trope is strong enough that you can use it at your advantage to give a good sense of cartography only by naming places. You can give measures by what they mean to the characters. If a kilometer breaks immersion in a fantasy setting, how about using measures that means something to them? Yards, feet and any imperial unit "feels" appropriate for a fantasy setting because it refers to something the reader know, even if they are not europeans (meaning, not imperial units-user). How long is a road when using horses? How many times must they stop to rest? Do their beards grow? How much? Are they tired at the end of their trek? Was it easier than they thought? How much did they eat? Did they had to count on their supplies? Hunt in the woods? Gather potatoes in fields? Do they starve? How do people greet them? All these questions can help the reader feeling what it is like to travel from one country to another, from the length of the trek to the character of the people they will meet, thus giving us indirect informations about the land they're living in. A good choice of words will make Arthur starve on the muddy path to Windheld Manor. A poor choice of words will just make "Jim goes 3km to town". use time instead of distance, "[hours, days, weeks or months] of travel" people travel at different rates so while it gives an idea of the relationship between two places it doesn't give a precise distance. when you do give numbered distances be vague, "hundreds of miles", "four thousand odd miles", again it gives the reader an idea of what it takes to go from A to B but without giving an exact position. with directions use the cardinal points, north, south, east, and west, precisely but the then be vague about the secondary notes "a hundred miles north, and somewhat east of...", this puts you roughly on the map without being an exact position or travel distance. I would use relative sizes to compare sizes or countries. "The map makers say five hundred of Fengard could fit in the East Kingdom". I would use seasons to indicate travel time and difficulty. "It took us all Spring and half of summer to make our way here from Tavik's Spire, If we leave now we will surely be far north for months of winter. It will kill us. We can go west a month, as far as the forked valley before we turn north, but we must tarry there until mid-winter before we strike out for the north." 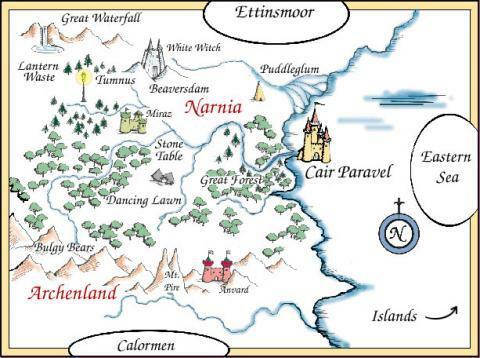 One of the reasons that fantasy books often have maps is that in order to have a coherent geography you need to have it properly worked out first. If you have a functional geography sorted out as part of your research and world building it is actually easier to describe in the text as there is less temptation to try to work it out as you go along. Most of the time the reader need to know any more than a tiny fraction of this and most of it should come out naturally. But if you have coherent geography worked out beforehand it makes it a lot easier to insert the appropriate references into the text. Often the problem is not so much a lack of overall detail but rather internal inconsistencies. I think you only get problems when you try to force a reader to visualise something without giving them enough information to do so naturally. For example you say country A is about the size of France, try looking at that the other way...how do you visualise how big France is ? Ultimately if you want the reader to know the precise geography of a region then draw a map. Maps exist because they are the most efficient way to do this. However if you just want to tell the story then think about what is significant to the characters. Say for example they need to travel to Town A, what is the information about its location whcih is significant ? I would argue that how long it takes to get there, how you get there and how to find it are the terms they will be thinking in. For example you could say a town is two days travel north along the coast road. Equally if the characters have only a hazy idea of geography then a hazy idea is all you need to give the reader. Presumably things will become clearer as the go along. If you say they are expecting a three week journey on foot to the West then that is probably all they know. Equally if the story follow events on the journey then the reader will have a sense of what that journey involves. In fact sometimes a fairly uneventful journey can be useful in a story as it's a good opportunity for characters to interact as a leisurely pace and is a natural way to get some exposition in. They could for example have a conversation about how long they think it will take them to get there, and what it will be like. Indeed Lord of the Rings is mostly things which happens to people while they are trying to get somewhere. Not the answer you're looking for? Browse other questions tagged fiction style fantasy description or ask your own question. Can justifying “boobplate” armor in the fantasy genre damage its credibility as a serious setting? How to describe 4 main characters at once without overloading the reader with information?